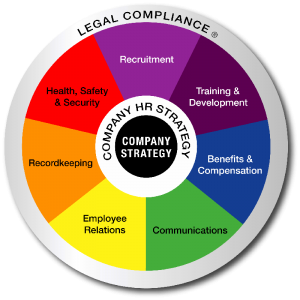 Legal Compliance - strategic HR inc. helps you understand & manage it. Are you managing your HR legal compliance effectively? It can be overwhelming to try to keep up with the litany of local, state, and federal employment laws, especially since they vary based on the size of the company. You want to ensure that your company is compliant to avoid penalties and stay on the right side of the law, but it seems like a full-time job. Businesses of all sizes are expected to know these employment laws and follow them, whether or not they have the manpower to keep up with ever changing legislation. strategic HR inc. can help you stay on top of relevant regulations, assess the impact on your company, and will advise you on the appropriate times to seek legal counsel from an attorney. For help in managing your HR Legal Compliance, Contact Us today! Link to HR Laws for a quick and easy reference to federal employment laws. Take advantage of our Virtual HR Support Center giving you 24/7 access to searchable and easy-to-understand state and federal law libraries, in addition to an extensive array of resources to help you manage your HR compliance and employee relations needs. As a Federal Contractor, are you aware of the Affirmative Action Plan (AAP) Requirements by the OFCCP? Don’t miss out on being informed on current issues and trends in human resources – sign up for our FREE newsletters today! strategic HR inc. has been instrumental in keeping our HR department up-to-date and compliant with the latest federal legal compliance regulations, providing fast and cost effective solutions for our business to implement. We are extremely happy with the services we received from strategic HR inc. Our consultant assessed our HR needs and developed a priority list that we have been “attacking” consistently. Several unexpected situations occurred in our business too, that required immediate attention. Our consultant was very thorough and was quick to respond with solutions. We are very thankful to have found a company that provides personal attention, solid knowledge of HR issues, and adaptability to meet the specific needs of our business. Worried that your HR practices may NOT be in compliance with current laws and regulations? Try our FREE HR Pulse to check and see!